If you’re considering getting Gears of War 4 for the PC, you’ll need a couple of things to get you started, including Windows 10, at least an i5 processor, 8GB of RAM and 80GB of free hard drive space. Yes, 80GB of hard drive space. Over on the Xbox News site they announced the system specifications along with revealing the official GamesCom 2016 gameplay video that runs at 60fps and 4K. You can check out the 10 minute gameplay video below, which introduces gamers to two new enemies, the Drones and the Pouncers. The Drones are steroid-abusing Swarmers, where-as the Pouncers are a unique quadrupedal beast that shoots quills at its enemies. You can check out the video below. There’s nothing new in the video other than the enemies, and the enemies offer nothing really new except for the Pouncers. They pounce on you and shoot things at you and can end up being a real nuisance if you don’t watch your corners. As far as the gameplay is concerned, there’s just more of the same. 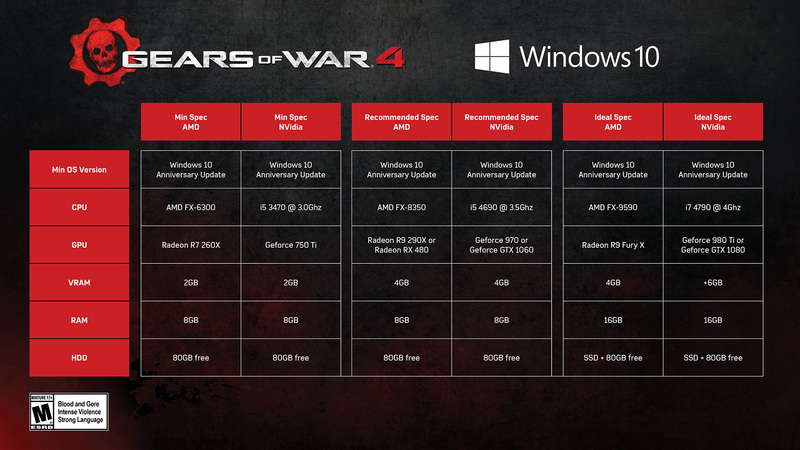 The real news is in the system specifications for the PC version of Gears of War 4. The game will require Windows 10 all the way around. If you have any plans at all of getting this game on PC, you cannot escape the Windows 10 requirement. If you’re running an AMD setup you’ll need an FX-6300 at the bare minimum and an R7 260X. If you’re running an Intel and Nvidia combination, you’re going to need a GTX 750Ti and an i5 at 3.0ghz to run the game. On the upper end of the spectrum you’ll need a R9 Fury X or a GTX 1080 for 60fps gaming at a 4K resolution. The CPU requirements also bump up to an AMD FX-9590 and an Intel i7 4790. They have a list of the minimum specs for AMD and Nvidia, along with recommended specs for AMD and Nvidia, and ideal specs for AMD and Nvidia. You can check out the chart below. Probably, the most surprising thing out of it all is the fact that you’ll need 80GB of hard drive space free. Insane. I assume that’s due to the 4K native texture resolution? If that is the case then at least props have to be given to The Coalition for going all in on the 4K hype train. You can look for Gears of War 4 to launch October 11th for the Xbox One and Windows 10.